Many years ago I used to live in Boston and would on occasion wander over to Harvard Square. A frequent stop would be Harvard Book Store a large independent bookstore. A lot of things have changed in Harvard Square since then but Harvard Book Store is still there. Forbes reports that one of the reasons is that a new owner made an aggressive bet on printing books in the store (The Man Who Took on Amazon and Saved a Bookstore, May 10). You can walk into the store, request an out-of-print, or hard-to-find title, and a bookseller can print that book for you in approximately four minutes. We have written about Espresso Book Machines before. They are a nifty piece of technology and from an inventory management point of view make a lot of sense for lower volume titles. If you buy a Japanese built Toyota, where would you expect the final bit of assembly to be done? Would you believe Newark? The New York Times had an article on the process of receiving imported cars (Far From the Factory, Adding Final Touches, Sep 25). What is unsurprising is that car makers have processes in place to check for and repair any damage that occurred during shipment. What is a little unexpected is that they do some additional work to customize cars such as installing Bluetooth systems or putting on roof racks (see the picture at left). Toyota’s 98-acre operation at Newark’s port is something of a scaled-down assembly plant, though the work — adding a range of so-called port-installed options into 21 different models — is done largely by hand using simple tools, not by industrial robots controlled by computers. About 185 employees work in Toyota’s car wash, quality control center and five production shops here. 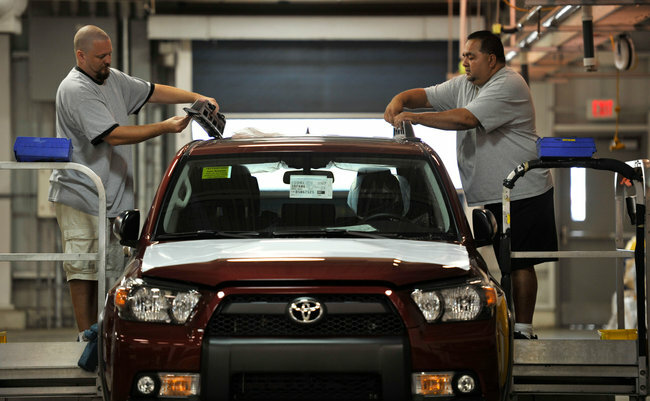 By adding items like floormats and GPS systems at its distribution centers instead of at its factories, Toyota gives customers a chance to tinker with their orders until just two days before the vehicles dock in Newark. And it gives dealers a way to stand apart from their competitors. The work would grind to a halt without Rui Sousa, whose job it is to order accessories daily from suppliers, based on expected needs in two days’ time. The key, he said, is limiting the volume of accessories for unpopular cars or those that are undergoing model changes, while keeping enough on hand for more popular cars. “We’re trying to find the right balance,” said Mr. Sousa, who has honed his orders so finely that the amount of just-in-time inventory has been cut by about two-thirds during the last four years.